Durgesh Manikrao Bholankar was 3 and half years old boy from Jalgaon district of Maharashtra. His father, Manikrao Bholankar owned 1.5 acres of un-irrigated land which produces just enough to meet domestic consumption needs of the family. 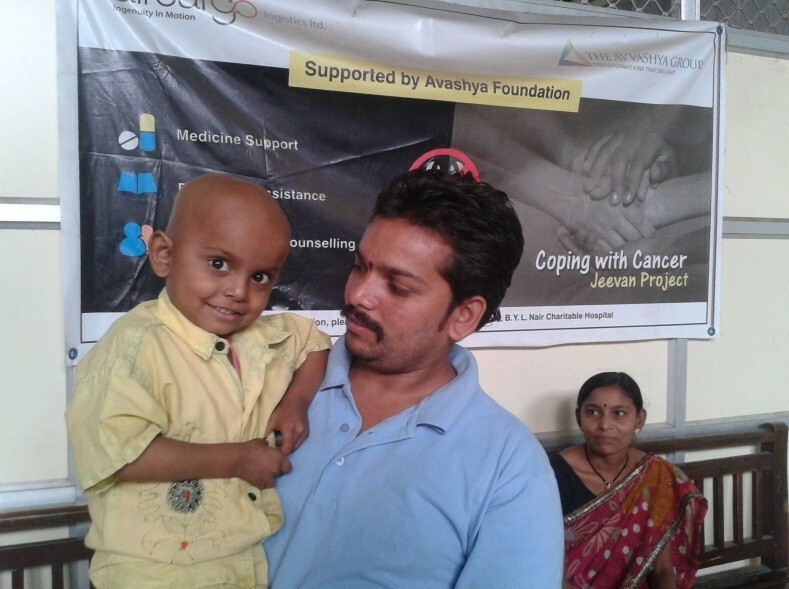 Durgesh Manikrao Bholankar was just about 4 years old when his health began to deteriorate. He would get frequent fevers and visiting the local doctor would only provide temporary relief. He was beginning to develop a limp which became a cause for concern for his family, in spite of seeking expert opinion of the doctor, Durgesh was not diagnosed correctly. Eventually his family was advised to consult an Orthopedic, who asked the family to arrange 30,000 INR as medical expenses. The family could not afford the treatment and had to resort to selling off their produce of maize and cotton and borrowing money. The family was in a state of shock and shattered emotionally as future of Durgesh was uncertain. Although, his medical condition was adverse, his family did not lose hope and confidence in the Medical Oncologist, Dr Purvi Kadakia at Nair Hospital. Pooja Prakash Ghorde is the only daughter to her parents, both of whom suffer from partial blindness. Since birth, Pooja faced eye problems. By the time she entered school; her parents had already taken to various eye doctors and exhausted their resources in her surgeries. Pooja had a troubled school life. At the tender age she had to struggle for admission and also had to face discrimination. At the age of six, when Pooja tried to seek admission in the nearby school, the school authorities suggested that she join a special school for the blind. But special schools refused too, on the grounds that her one of her eye was in a good condition. Finally, with the help of area social worker, Pooja got admission in New English School Vasai. Despite of all this difficulties, Pooja continued her studies with strong determination. Pooja’s unrelenting hard work which helped her scored distinction in SSC examination and got admission in first year in Vartak College Vasai. Her father managed to pay only 7000/- in a first year and the remaining amount was compensated by a trust fund. However, in the second year, the trust fund failed to support Pooja because of change in trust rules and regulations. Pooja now required further support in order to cover expenses for tuition classes. At this crucial juncture, Pooja received scholarship from The Avvashya Foundation. Pooja’s family feels, it would have been not possible for them to provide quality education and consequently provide her an opportunity to fair well, without the support of the foundation. The scholarship helped her secure 71% marks in HSC. Currently, Pooja is perusing B.Com in Banking and Insurance and harbors ambition of becoming an officer with the Bank. The family believes that support from Allcargo would be crucial in fulfilling dream of Pooja of becoming Officer in the bank and would play instrumental role in altering their economic condition and pave way for dignified life in the future. An effort by Allcargo Logistics and the Avashya Foundation, Nipun is aimed at skill development for the youth from the drought-affected areas of Maharashtra. The training they receive from Nipun will help them build their careers, leading to financial stability. Under this initiative Avashya Foundation has trained candidates in light and heavy motor vehicle category. Under the driving program we have successfully provided employment to 40% of the trained youth. Expanding its skill based training; the foundation has also launched training in unarmed security guards in partnership with Stealth Management Solutions Private Limited, which is affiliated with Security Sector Skill Development Council (SSSDC) under National Skill Development Corporation (NSDC). Training would be linked with Phase II of Pradhanmantri Kaushalya Vikas Yojna (PMKVY). It intends to create economic empowerment in the lives of trainees by imparting training and provide placement support. Under the Stealth partnership we have trained youth in two batches and provided employment to 70% of trained youth successfully. The deserving youth would be trained in a year and provided placement linkages and support. A project undertaken by Allcargo Logistics and Avashya Foundation, Maitree aims to improve the environment, by increasing the green cover in our country, while at the same time offering a fruitful source of livelihood to the tribal and economically backward communities of Maharashtra and Karnataka. Maitree reaches out to a large number of families from under-developed and tribal regions to be part of this initiative. School children are encouraged to be ambassadors of the programme and they are trained to ensure Maitree flourishes. Maitree intends to plant 10 lakh trees over the next five years.